Songs of Anarchy Volume 4 - Music from Season 7 features a stunning collection of revered performances from the hard-hitting and award-winning Fox television show. To celebrate one of the most captivating biker drama series ever, Friday Music once again enhances your music pleasure with the first time ever exclusive picture disc release of this stellar soundtrack album. This limited edition double picture disc album contains the final season soundtrack and features a plethora of classic tunes and fan favorites. Ed Sheeran’s smash hit Make It Rain, Amos Lee’s brilliant interpretation of Bob Dylans’ Boots Of Spanish Leather, and of course The Forest Rangers/White Buffalo rocking rendition of Queen’s Bohemian Rhapsody all add to the excitement of this trail blazing television series that continues to thrill its millions of fans worldwide. As with our previous audiophile vinyl editions SOA Volume 1 and SOA Volume 2 & 3, this collection features the Golden Globe® Award winning actress/singer Katey Sagal. Performing with The Forest Rangers, her stellar voice is featured on a standout performance of Greensleeves. This amazing double album is the last in a deluxe series of a limited edition Vinyl releases from the Sons Of Anarchy television soundtrack series with Friday Music. 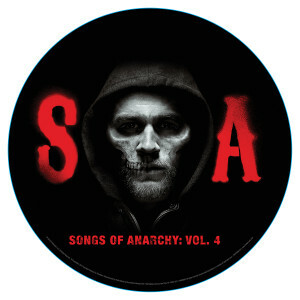 For a very limited time, Songs of Anarchy Volumes 4 - Seasons 7 will be presented on a stellar 2 LP Picture Disc set, with stunning graphics featuring photos of all your favorite SOA actors like Charlie Hunnam, Katey Sagal, Ron Pearlman, Maggie Siff, Mark Boone Junior and other greats as you will remember from this incredible series created by Kurt Sutter.